The great Russian writer, artist and philosopher visited Ceylon in 1924 and spent a considerable amount of time in Colombo before exploring the ancient ruins of Anuradhapura. Anton Chekov’s brief stay on the island known as ‘The Pearl of the Indian Ocean’ has been well documented. Two hotels in Colombo claim to have hosted the great Russian writer when he was on his way home from Sakhalin to Moscow. There was another great Russian writer, artist and philosopher who had a brief sojourn in Sri Lanka or Ceylon as it was then called: Nicholas Roerich. For the Russian philosopher, Lanka would always be synonymous with the great Hindu epic, The Ramayana. “But, after all, only in fragments do Colombo and Ceylon recall the ancient Lanka of Hanuman, Rama, Ravana and other giants,” he wrote. Nicholas Roerich also visited the sleep and still beautiful town of Mount Lavinia, which is south of the Colombo fort. “The public baths near the bitter-sweet mountain, Lavinia, do not suggest the domain of ancient giants. Slender palms shame-facedly bend down to the spray of the tide.” The area is still known for its village-like atmosphere, leafy and hilly lanes and one of the cleanest city beaches anywhere in the world. 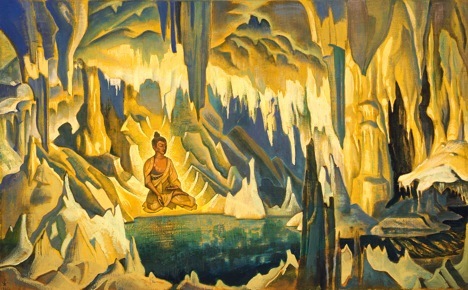 Throughout his writings, Roerich displayed both a love and a tremendous understanding of the Buddhist philosophy. “Many temples and palaces guard the fragments of one of the best periods of the Teaching,” he wrote. Roerich visited Anuradhapura, which was the capital of the Sinhalese kings from the 4th century BC to the 11th century AD. “Like skeletons stand the fragments of Anuradhapura; consider that Anuradhapura is not entirely explored,” he wrote. “And Adam’s Peak is not enticing. By the remains of Anuradhapura one may judge how powerful was Borobodur in Java.” Wickramatunga says it is unclear if Roerich climbed up Adam’s Peak. “We can’t be sure why the reference to Adam’s Peak came up when he was writing about Anuradhapura, but he may have climbed the mountain, given his enthusiasm for the hills and his spiritual nature,” the historian added. Some historians in Sri Lanka suggest that the British Colonial Administration tried to deny giving Roerich permission to enter India from Sri Lanka and it took the Russian artist’s influential friends to help secure the necessary permits. After his brief sojourn in Ceylon, Roerich travelled by ship across the Palk Strait into India, from where his epic journey to the Himalayas and beyond began.